Publisher: H.S. Rich & Co. (reprint, Arno Press), 1903/1974. Hard Cover, 718 pages, 9 x 12. 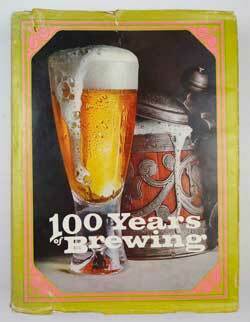 Simply put, 100 Years of Brewing is one of the greatest works ever published on the brewing industry. Originally published in 1903, the 718-page oversized book is a comprehensive look at beer-making around the world throughout the 19th century with its main focus being on the United States. It includes detailed historical write-ups on virtually every American brewery in operation in 1903, accompanied by hundreds of illustrations of breweries and the people behind them. Also included are thorough discussions of every aspect of brewing history -- social, technological, architectural, statistical, etc. These 1974 reprints are becoming extremely scarce as beer enthusiasts and researchers have discovered the depth and value of the information contained therein. Here is a richly overflowing collection of the stories and sidelights, facts and figures, as well as the men, machines and malt behind one of the last century's greatest romances - between modern science and the traditional art of making beer. This special limited edition is a complete reprint (1974) of the mammoth 718-page volume originally published in 1903 by H. S. Rich & Co., of Chicago and New York. The idea was conceived in 1901 when a trade journal, Western Brewer, decided to celebrate the 25th anniversary of its existence along with a similar anniversary marking the introduction of commercial refrigeration, an event of immense importance to today's wide-spread popularity of beer consumption. The book which resulted is a masterpiece of Germanic scholarship, reflecting the characteristic middle-European values of the new Americans who dominated the brewing industry. By compiling the materials for ONE HUNDRED YEARS OF BREWING, the editors of Western Brewer intended to " ... dispel certain misapprehensions which have long existed in some minds as to the character of the typical brewer and his moral attitude toward the business of his life. It may be asserted unhesitatingly that he believes in the manufacture of beer as an incentive to temperance, and that his constant aim is to put forth a beverage as pure and nourishing, and yet mildly stimulating, as can be procured by the use of the best materials and the most advanced methods and mechanisms." In support of this assertion they chose to " ... place the brewer and his beer before the world in their true light ... to prove that the most enlightened peoples of the earth are gradually abandoning the intoxicating distilled spirits in favor of the purer and more wholesome and less alcoholic malt liquors." The retrospective reader can well appreciate the dilemma and subsequent disaster facing these men who had so much admiration for their product. They felt that beer offered a decent alternative to hard liquor in much the same manner as today's proponents of marijuana argue its value as an alternative to hard drugs. With a mixture of pride and a dark anticipation of their unjust persecution by the temperance movement the brewers presented their case to the American public. Sadly, in less than two decades a refreshing glass of beer would become a stolen pleasure. Everywhere in this book one finds men who were truly in love with their occupation. Many of the names are still well known: Peter Ballantine of Newark, Christian Schmidt of Philadelphia, Adolphus Busch of St. Louis, Fred Pabst and Joseph Schlitz of Milwaukee, John Labatt of Ontario, Frederick Schaefer of New York City, Theodore Hamm of St. Paul and hundreds more ... including Matthew Vassar of Poughkeepsie, New York. Equally fascinating are the introductory passages on brewing during pre-historic, ancient and medieval times; the 19th century's revolutionary use of power sources, labor-saving machinery and refrigeration; carefully reproduced details of brewery architecture and construction; comprehensive descriptions of the various processes involving fermentation, malting, mashing, boiling, hopping, cooling, racking and bottling; plus a history of the industry in the United States, Canada, Latin America, Great Britain, Europe and Japan. John R. Alley, Boston, Mass. American Brewing Company premises, St. Louis, Mo. James Anderton, Beaver Falls, Penna. Eberhard Anheuser, St. Louis, Mo. Augusta Brewing Company, Augusta, Geo. Baer & Stegmaier's Old Brewery, Wilkesbarre, Penna. Ballantine Breweries, Premises, Newark, N.J.
Barbey (Peter) & Son Premises, Reading, Penna. Bartels Brewing Company's Premises, Edwardsdale, Penna. Bartels Brewing Company's Premises, Syracuse, N.Y.
Gustav A. Barth, Stapleton, Staten Island, N.Y.
Bartholomae & Leicht Brewery (United States Brewing Company Branch 2), Chicago, Ill.
Bartholomae & Roesing Brewing and Malting Company Premises, Chicago, Ill.
John C. Bauer, San Francisco, Calif.
Bauernschmidt (Geo.) Brewery, Baltimore, Md. Bay View Brewery, Baltimore, Md. Geo. Bechtel, Stapleton, Staten Island, N.Y.
Geo. Bechtel Jr., Stapleton, Staten Island, N.Y.
John Bechtel, Stapleton, Staten Island, N.Y.
Bechtel Brewery, Stapleton, Staten Island, N.Y.
Becker Brewing and Malting Company, premises, Ogden, Ut. Bellingham Bay Brewery, Whatcom, Wash.
Benedictine Society Plant, Latrobe, Penna. Benedictine Society Brewery, Latrobe, Penna. Berghoff Brewing Company's Premises, Fort Wayne, Ind. Bermes (Daniel) Boulevard Brewery, Weehawken, Town of Union, N.J.
Best's (Jacob) Old Brewery, Milwaukee, Wisc. Beverwyck Brewing Company, Albany, N.Y.
Blatz (Val.) Brewing Company Premises, Milwaukee, Wisc. George A. Bohrer, Lafayette, Ind. Bowler Brothers' Old Brewery, Worcester, Mass. Brand Brewing Company's Premises, Chicago, Ill. Brand (Michael) Brewery (U.S. Brewing Company), Chicago, Ill.
George Brehm & Son, Brewery Premises, Baltimore, Md. Henry A. Brehm, Baltimore, Md. Brewers Hall, Centennial Exposition, Philadelphia, Penna. Brosemer (L.) Brewing Company's Old Brewery, Oswego, N.Y.
Bub's (Peter) "Sugar Loaf" Brewery and Residence, Winona, Minn.
George J. Burkhardt, Boston, Mass. Burnell (J.H.) & Co's Underground Cellar, San Francisco, Calif.
Charles L. Centlivre, Fort Wayne, Ind. Centlivre Brewery, Fort Wayne, Ind. Centlivre (C.L.) Brewing Company Premises, Fort Wayne, Ind. Central Brewing Company's Officers (group), East St. Louis, Ill.
Central Brewing Company's Premises, East St. Louis, Ill.
Chicago Brewery (United Breweries Company), Chicago, Ill.
Citizens' Brewery (United Breweries Company), Chicago, Ill.
City of Chicago Consolidated Brewing and Malting Company's Plants, Chicago, Ill.
Conrad's (Jacob) Keystone State Brewery, Philadelphia, Penna. Consumers Park Brewing Company, Brooklyn, N.Y.
John S. Cooke, Chicago, Ill.
Coors (Adolph) Brewery Premises, Golden, Colo.
Charles G. Curtiss, Buffalo, N.Y.
Dobler Brewing Company Premises, Albany, N.Y.
Andrew J. Dotterwich, Dunkirk, N.Y.
Thomas M. Dukehart, Baltimore, Md. Dunlop Brewery Script, Albany, N.Y.
Duquesne Brewing Company Premises, Pittsburg, Penna. George F. Eckart, Bridgeport, Conn.
Eckart Brothers Brewery Premises, Bridgeport, Conn.
Eckert-Lott Brewery (founded 1763), Reading, Penna. Samuel Eckstein, West New Brighton, Staten Island, N.Y.
Monroe Eckstein, West New Brighton, Staten Island, N.Y.
Elgin Eagle Brewing Company's Plant, Elgin, Ill.
E.H. Elzemeyer, East St. Louis, Ill.
Engel & Wolf's Lager Beer Brewery in the "Fifties," Philadelphia, Penna. Robert W. Evans, Hudson, N.Y.
Albert Fisher, Salt Lake City, Ut. Fisher (A.) Brewing Company's Premises, Salt Lake City, Ut. Fitger (A.) & Co., Duluth, Minn.
Fitzgerald Brothers Brewing Company Premises, Troy, N.Y.
Fredericksburg Brewery (old), San Jose, Calif.
John Gardiner, Jr., Philadelphia, Penna. Globe Brewery Vaults (built 1744), Baltimore, Md. Gluek Brewing Company Premises, Minneapolis, Minn.
M.K. Goetz, St. Joseph, Mo. Gottfried Brewing Company Premises, Chicago, Ill.
Fred H. Gottlieb, Baltimore, Md. Gottlieb-Bauernschmidt-Straus Brewing Company Officers, Baltimore, Md. Gottlieb-Bauernschmidt-Straus Brewing Company's Plants, Baltimore, Md. Granger Brewing Company's Premises, Hudson, N.Y.
Robert H. Graupner, Harrisburg, Penna. Great Seal of the Province of N.Y.
Old Greiner Brewery (Madison Brewing Co.), Madison, Ind. August Griesedieck, East St. Louis, Ill.
H.L. Griesedieck, East St. Louis, Ill.
Paul H. Griesedieck, East St. Louis, Ill.
Henry Gund, La Crosse, Wisc. John Gund, La Crosse, Wisc. Gund (John) Brewing Company Premises, La Crosse, Wisc. Hack & Simon Brewery Premises, Vincennes, Ind. Henry F. Hagermeister, Green Bay, Wisc. Franz H. Hagermeister, Green Bay, Wisc. Theodore Hamm, St. Paul, Minn.
John G. Hartmann, Wilmington, Del. Hartmann & Fehrenbach Brewing Company Premises, Wilmington, Del. Hartmann & Fehrenbach Original Brewery, Wilmington, Del. Harvard Brewing Company Premises, Lowell, Mass. John Hauenstein, New Ulm, Minn.
Hauenstein (John) Brewing Company Premises, New Ulm, Minn.
Hauenstein's Old Brewery, New Ulm, Minn.
Paul Hauser, St. Paul, Minn.
Ferdinand Heim, Kansas City, Mo. Theodore R. Helb, York, Penna. Heurich's (Christian) Brewery Premises, Wash., D.C.
Highland Brewing Company Premises, Highland, Ill.
John L. Hoerber, Chicago, Ill.
Howard & Fuller Brewery Premises, Brooklyn, N.Y.
Ignatz Huber, Rock Island, Ill.
Otto Huber, Jr., Brooklyn, N.Y.
Otto Huber, Sr., Brooklyn, N.Y.
John A. Huck, Chicago, Ill.
Ind. Brewing Association's Premises, Marion, Ind. John Kam, Sr., Buffalo, N.Y.
Moses Kendall, Sioux Falls, S.D. N.W. Kendall, New Haven, Conn.
James W. Kenney, Boston, Mass. Keystone Brewery (Theo. R. Helb, proprietor), York, Penna. Louis F. Knipp, Janesville, Wisc. Fred Krahenberg, San Jose, Calif.
Gottfried C. Krueger, Newark, N.J.
John F. Krueger, Newark, N.J.
Krug (Fred) Brewing Company Premises, Omaha, Neb. Kusterer (C.) Brewery (old), Grand Rapids, Mich.
Franklin P. Lauer, Reading, Penna. George F. Lauer, Reading, Penna. Ledger Pages of Albany Brewing Company, Albany, N.Y.
Thies J. Lefens, Chicago, Ill.
Andrew Leicht, Hudson City (Jersey City), N.J.
Lembeck & Betz Eagle Brewing Co. Premises, Jersey City, N.J.
Lemp's (J. Adam) Original Twelve-barrel Lager Beer Kettle, St. Louis, Mo. Lemp's (J. Adam) Original Office and Brewhouse, St. Louis, Mo. Lemp's (J. Adam) Original Cellar House, St. Louis, Mo. Moriz Levinger, Sioux Falls, S.D. Lill & Diversey's Brewery, Chicago, Ill. Lock City Brewery, Lockport, N.Y.
Mathie Brewing Company Premises, Wausau, Wisc. Mattes Brewery (old), Nebraska City, Neb. McAvoy Brewing Company Premises (Chicago Breweries Limited), Chicago, Ill.
John D. McKechnie, Canandaigua, N.Y.
Metz Brothers Brewing Company Premises, Omaha, Neb. Metz Brothers Old Brewery, Omaha, Neb. George J. Meyer, Buffalo, N.Y.
Molter's (Henry T.) Brewery, Providence, R.I.
Monarch Brewery (United Breweries Company), Chicago, Ill.
Monroe Brewing Company's Premises, Rochester, N.Y.
Moravian Brewery (erected 1749), near Bethlehem, Penna. Morris' (Anthony) First Brew-house, Philadelphia, Penna. Morris' (Anthony) Second Brew-house, Dock and Pear streets, Philadelphia, Penna. National Pasteurizing Machine (Barry-Wehmiller Machine Company), St. Louis, Mo. North-Western Brewery (United Breweries Company), Chicago, Ill.
North-Western Brewery No. 2 (United Breweries Company), Chicago, Ill.
Norton (T.M.) Brewing Company Premises, Anderson, Ind. George J. Obermann, Baltimore, Md. William B. Ogden, Chicago, Ill.
Orth's (John) First Brewery, Minneapolis, Minn.
Pabst Brewing Company Plant, Milwaukee, Wisc. Poth (F.A.) & Sons Brewery Premises, Philadelphia, Penna. Quinn & Nolan Ale Brewing Company Plant, Albany, N.Y.
Radeke (F.D.) Brewing Company Premises, Kankakee, Ill.
Frank Reisch, Jr., Springfield, Ill.
Frank Reisch, Sr., Springfield, Ill.
Rubsam & Horrmann's Old Brewery, Stapleton, S.I., N.Y.
Ruehl Brewery (United Breweries Company), Chicago, Ill.
Ruehl Brothers Brewing Company's Premises, Chicago, Ill.
Henry H. Rueter, Boston, Mass. Saladin (William) Brewery, Chicago, Ill.
Hermann B. Scharmann, Brooklyn, N.Y.
August Schell, New Ulm, Minn.
Schell (August) Brewery, 1881, New Ulm, Minn.
Schell (August) Brewery Premises, New Ulm, Minn.
George C. Schemm, Saginaw, Mich.
Peter A. Schemm, Philadelphia, Penna. Schemm (Peter) & Son Brewery Premises, Philadelphia, Penna. Edward A. Schmidt, Philadelphia, Penna. Schmidt (K.G.) Brewery (U.S. Brewing Co.), Chicago, Ill.
Schmidt (Jacob) Brewing Company Premises, St. Paul, Minn.
Schmulbach Brewing Company's Premises, Wheeling, W.V. Schoenhofen (Peter) Brewing Company Premises, Chicago, Ill.
Martin J. Schott, Highland, Ill.
Henry Schuster, Sr., Rochester, Minn.
Schuster's Brewing Company's Premises, Rochester, Minn.
Sehring (Fred) Brewing Company Premises, Joliet, Ill.
Sehring (Fred) Brewery, Joliet, Ill.
Seipp (Conrad) Brewery, Chicago, Ill.
Sieben Brewery (United Breweries Company), Chicago, Ill.
John M. Smith, Philadelphia, Penna. South African Breweries, Ltd., view of new brewery near Capetown, S.A.
South Chicago Brewery (United Breweries Company), Chicago, Ill.
Standard Brewing Company's Premises, Mankato, Minn.
Star Brewery Company Premises (1870), Belleville, Ill.
Star Brewery Company Premises (Present), Belleville, Ill.
Edw. W. Stiefel, Baltimore, Md. Charles G. Stifel, St. Louis, Mo. Harry J. Stoeckle, Wilmington, Del. Stoeckle (Joseph) Brewing Company's Premises, Wilmington, Del. Stoeckle (Original) Brewery, Wilmington, Del. Storage Elevator - Pabst Brewing Company, Milwaukee, Wisc. Storz Brewing Company Premises, Omaha, Neb. Carl A. Strangmann, Buffalo, N.Y.
John N. Straub, Pittsburg, Penna. Jos. H. Straus, Baltimore, Md. Stroh Brewery Company Premises, Detroit, Mich.
Charles E. Succop, Pittsburg, Penna. George Tinker, St. Louis, Mo. Trommer (J.F.) Evergreen Brewery Premises, Brooklyn, N.Y.
United Breweries Company, Chicago, Ill.
United States Brewing Company, Branch 1 (Michael Brand Brewery), Chicago, Ill.
United States Brewing Company, Branch 2 (Bartholomae & Leicht Brewery), Chicago, Ill.
United States Brewing Company, Branch 4 (K.G. Schmidt Brewery), Chicago, Ill.
William T. Van Nostrand, Bunker Hill Breweries, Charlestown, Boston, Mass. Voigt Brewery Company Premises, Detroit, Mich. Von der Horst (J.H.) Brewery, Baltimore, Md. Charles J. Vopicka, Chicago, Ill.
Charles H. Wacker, Chicago, Ill.
Wacker & Birk Brewing and Malting Company Premises, Chicago, Ill.
Ellis Wainwright, St. Louis, Mo. Paul Weidmann, Sr., Brooklyn, N.Y.
West End Brewing Company Premises, Utica, N.Y.
West Side Brewery, Chicago, Ill.
John G. White, Albany, N.Y.
Herman W. Wieland, San Francisco, Calif.
John Wieland, San Francisco, Calif.
Charles C. Wolf, Philadelphia, Penna. Anthony Yoerg, St. Paul, Minn.
Frank D. Yuengling, Pottsville, Penna. Frederick G. Yuengling, Pottsville, Penna. William G. Yuengling, Pottsville, Penna. Adolph J. Zang, Denver, Colo.
Zang (Ph.) Brewing Company Premises, Denver, Colo.